VANCOUVER, BC, CANADA, March 20, 2019 /EINPresswire.com/ — Vancouver, Canada – March 20, 2019 – Nexus Gold Corp. (“Nexus” or the “Company”) (TSX-V: NXS, OTCQB: NXXGF, FSE: N6E) is pleased to report geochemical results from recent exploration activity at the 100% -owned, 98-sq km Dakouli 2 Gold Project, located on the Goren Greenstone Belt, central Burkina Faso, West Africa. In late 2018 the Company conducted an initial mapping/sampling program at Dakouli 2, collecting 25 samples at that time. 11 samples returned values greater than 1 g/t Au and five samples exhibited various concentrations of coarse, nuggety, visible gold, returning assay values greater than 11 g/t Au. 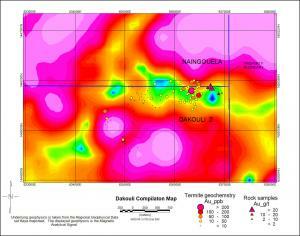 All 25 samples taken to date at Dakouli 2 have tested positive, with several returning significant gold values. 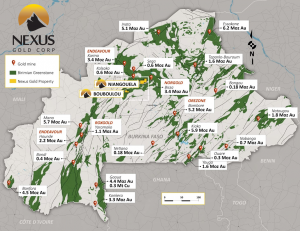 Nexus Gold is a Vancouver-based gold exploration and development company with active projects in West Africa, and in Canada. 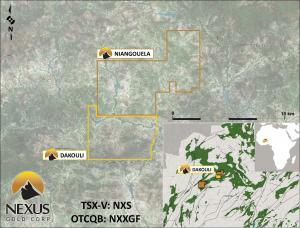 For more information please visit www.nexusgoldcorp.com.